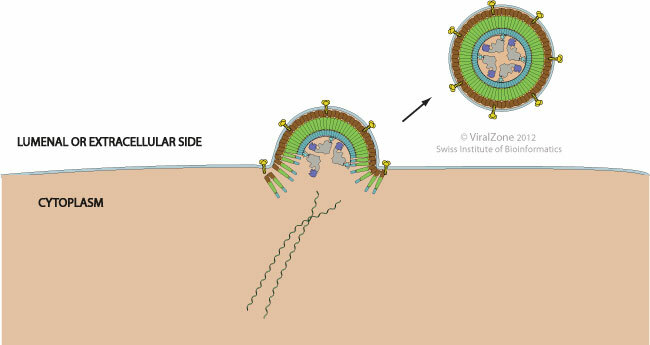 Budding enables viruses to exit the host cell and is mostly used by enveloped viruses which must acquire a host-derived membrane enriched in viral proteins to form their external envelope. Viruses can bud at every stage in the ER-Golgi-cell membrane pathway. Nucleocapsids assembled or in the process of being built induce formation of a membrane curvature in the host cell membrane and wrap up in the forming bud which is eventually pinched off by membrane scission to release the enveloped particle . Many viruses, such as arena-, filo-, flavi-, hepadna-, herpes-, rhabdo-, and some paramyxoviruses, recruit host ESCRT proteins for budding. However, for orthomyxo-, toga-, and corona- the budding is ESCRT-independent . The only prokaryotic viruses known to bud are the Plasmaviridae . Tetherin(D28137:9606) expression that follows the establishment of the cell antiviral state impairs the release of many enveloped viruses . ISG15(M21786:9606) expression that follows the establishment of the cell antiviral state inhibits ESCRT-mediated viral budding. ISG15(M21786:9606) is conjugated to CHMP5 and thereby disrupts further protein associations needed for functional ESCRT complex association .